Most people carry building souvenirs in their pockets every day without realizing it. Have you noticed how many coins have buildings on them? 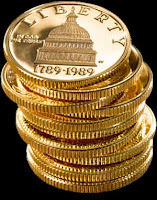 We are all familiar with the U.S. penny with the Lincoln memorial and the nickel with Jefferson Memorial on the reverse side. As an architecturally related collection, the case can be made for souvenir building collectors to also collect coins. 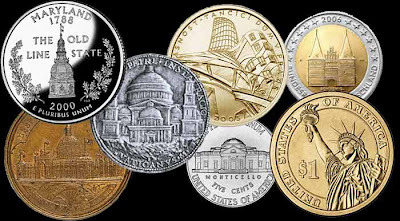 Coin s from various countries’ currency, medallions and even paper currency honor buildings and other structures. Romans had a long history of highlighting buildings on their coins. Last month, the U.S. Mint released redesigned Pennies for the first time in 50 years. Commemorating the 200th anniversary of Abraham Lincoln's birth, the one-cent coins reflect four different designs, each one representing a different aspect, or theme, of President Lincoln's life: a log cabin that represents Lincoln’s humble beginnings in Kentucky, a young professional Abraham Lincoln in front of the State Capitol in Illinois and the half-finished United States Capitol dome. A few of the new US State Quarters also have buildings: Maryland’s quarter features its state house, Iowa’s features a one-room schoolhouse, Maine’s features a lighthouse and NY’s quarter shows the Statue of Liberty. Do you collect any other architecturally-related items? Perhaps you also collect stamps, post cards, books or old photographs depicting buildings? Let us know using the comments link below.